The video is currently unavailable due to further editing. We appologise for any inconvenience. On July 1st, 1912, structural ironworkers topped off the Woolworth Building's steel frame with an American flag and New Yorkers celebrated the "Highest in the World." Yet the project had started out as a mere 20-story office building. 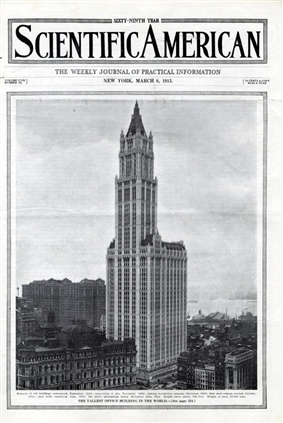 Only after Frank W. Woolworth's disjointed process of parcel acquisition and Cass Gilbert's erratic, protracted sequence of design did the Woolworth Building's spectacular 792-foot high tower rise to command its surroundings. And while both Gilbert and Woolworth participated in the day's obsession with big spatial ideas, Gilbert had romantically aspired to build the world's tallest tower and Woolworth simply to erect a "giant signboard" to advertise his chain of stores around the world. How did Gilbert and Woolworth negotiate such aims with the realities of the marketplace to construct what the New York Times called "The World’s Greatest Skyscraper"?